25 days, 06h:08m:10s £8.00 Buy now! Alcatraz 1 days, 08h:00m:53s £9.95 Buy now! ST BASIC / Metacomco BASIC - Revised Edition 1 days, 08h:00m:53s £19.95 Buy now! Their Finest Hour - The Battle Of Britain 1 days, 08h:00m:53s £9.95 Buy now! Battlescapes - Borodino 1 days, 08h:02m:53s £6.95 Buy now! Chase HQ II (H.Q.) - S.C.I. Special Criminal Investigation 1 days, 08h:02m:53s £12.95 Buy now! No Excuses 1 days, 08h:07m:16s £9.95 Buy now! Battlescapes - Borodino 1 days, 08h:09m:20s £6.95 Buy now! Alcatraz 1 days, 08h:09m:20s £9.95 Buy now! ST BASIC / Metacomco BASIC - Revised Edition 1 days, 08h:09m:20s £19.95 Buy now! Their Finest Hour - The Battle Of Britain 1 days, 08h:09m:20s £9.95 Buy now! Lemmings (Book Club Release) 1 days, 08h:09m:20s £13.95 Buy now! New Atari User Magazine - Issue No. 49 1 days, 08h:17m:55s £3.65 Buy now! 4 Quattro Fighters (Compilation) 1 days, 08h:18m:57s £6.95 Buy now! Italy 1990 - The World Cup Starts Here! 1 days, 08h:19m:57s £3.95 Buy now! Rogue for the Atari ST 1 days, 08h:19m:57s £4.50 Buy now! The Story So Far - Volume 1 (Compilation) 1 days, 08h:19m:57s £14.95 Buy now! 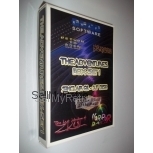 Advanced Ski Simulator 1 days, 08h:19m:57s £4.95 Buy now! Microprose Formula One Grand Prix (F1GP) 1 days, 08h:32m:26s £10.95 Buy now! Nigel Mansell's Grand Prix 1 days, 08h:32m:27s £7.50 Buy now! Megalomania / First Samurai (Compilation) 1 days, 08h:33m:27s £7.95 Buy now!